Ernesto Alfredo Teran Cornejo, or simply ‘Neto’ to all that know him, is the Country Manager at Biz Latin Hub – Ecuador. He has had a long and illustrious career has been typified by a never-ceasing passion to improve and promote his country as a place to both visit and conduct commercial activities. After studying in Spain, Neto returned and established his own law firm. Born and raised in Quito, the capital of Ecuador, he attended the San Francisco de Quito University where completed his degree in Law. Having completed his undergraduate degree, he proceeded to work for 3 years at the Chamber of Industries and Production. During his time here, Neto provided legal advice to companies established in over 30 different industries, whilst also playing a key role in the legislative process, assisting with the drafting and creation of laws for the betterment of the Ecuadorian productive sector. The experience he gained in his role with the Chamber inspired Ernesto to continue his education. He went to Madrid, Spain in order to complete his MBA at the prestigious EAE business school. In August 2017, Neto returned from Madrid to establish his own law firm with an associate. Now armed with 6 years of elite industry experience, a wealth of legal knowledge and the experience of working in his own company, Ernesto joined Biz Latin Hub in May 2018. 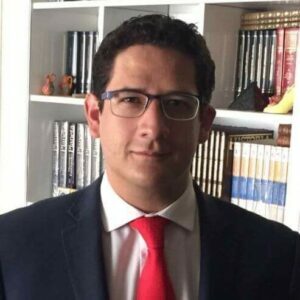 In the short tenure that Ernesto has worked with the company, he has demonstrated a passionate approach to driving business and client leads in Ecuador. He explains that his “knowledge and experience, both in business and legal fields provides the perfect mix of skills needed to truly understand the needs of our clients, and provide a personalised treatment for each and every one of them”. Ernesto is an incredibly proud worker, who takes great pride in the fact that Biz Latin Hub is one of the few companies in the country that provides comprehensive legal and accounting services in English, which he describes as a “market niche”. As well as being dedicated to his professional career, Neto is a charming and sociable man who lives an active lifestyle. He loves to play football with his friends, and is a fiercely competitive goalkeeper, guarding his goal as intensely as he pursues his business objectives. He also enjoys horse riding through the eye-catching and beautiful Ecuadorian Sierra. Get in contact with Neto and see how he and his team can support you and your business in Ecuador at [email protected].